Batman has some cool vehicles in Justice League and while the Batmobile and the Flying Fox get some much-deserved screen time in the film, the Dark Knight could have had an awesome motorcycle, too. 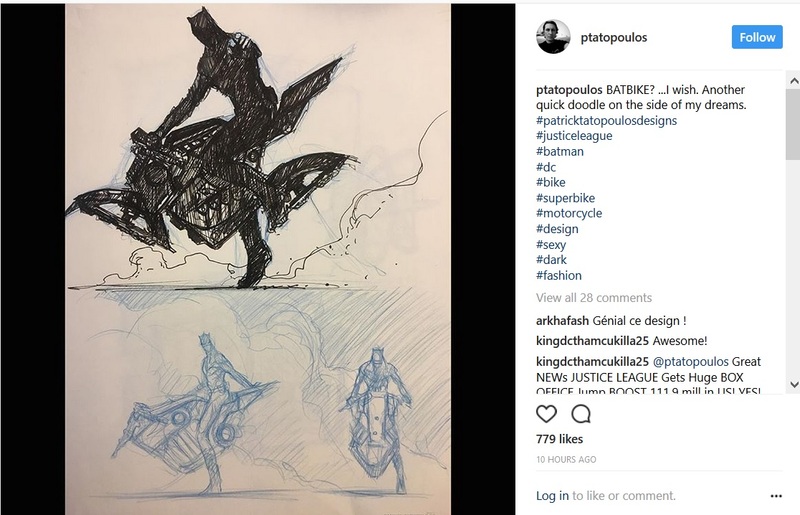 Justice League production designer Patrick Tatopoulos shared a few sketches on his personal Instagram earlier today of a concept he had for a Batbike. You can check out the post below. The idea of Batman having an elaborate and unique-looking bike isn’t new. In 2012’s The Dark Knight Rises, Batman had an epic if not unusual motorcycle that the rider practically had to lay on in order to and operated on two, very wide tires. It also had some pretty cool tricks, but it lacked an overall “Batman” look to it. Tatopoulos’s design remedies that by giving the motorcycle a distinctive and angular feel with lots of references to the shape of bat wings. The top sketch even has a seat that looks strikingly like the bat symbol or a batarang, and while the sketches don’t show wheels, the whole vehicle appears to have smaller profile which would give it dexterity for whatever chase Batman is on. It looks like there’s plenty of places for neat tools and weapons to be tucked away. It also looks like it would fit in nicely on the Flying Fox which itself is a unique vehicle. Tatopoulos recently shared concept art for the plane with the LA Times, revealing that some simple changes to the aircraft’s design had given it a look closer to that of Batman’s Batmobile, specifically by moving the placement of the cockpit. However, it doesn’t appear that this Batbike is going to be parked next the Batmobile or part of the DC Extended Universe Bat fleet anytime soon. Tatopoulos’s caption on the photo made it sound like this sleek take on Batman’s bike will remain something from the designer’s dreams. “Another quick doodle on the side of my dreams,” Tatopoulos wrote. Fans can check out the designer’s other Batman vehicle designs, including the unique Flying Fox, in Justice League in theaters now.